It is a good idea to consult Advisers as they can optimise you performance in all areas. Some are more useful than others, and the much of the Information can be gained in other ways. This will give you Information about the Terrain the cursor in currently on. Each type of Terrain is best suited to a particular type of production. This gives the number of Crosses currently generated, when they reach the edge of the screen a new Immigrant arrives at the Docks. Cross production can be increased by using Preachers, and by building Churches and Cathedrals. This will show Bells generated for the next member, Rebel Sentiment, size of the Royal Expeditionary Force, and which Founding Fathers you already have. This will show whether you have a realistic chance of winning the Revolution. 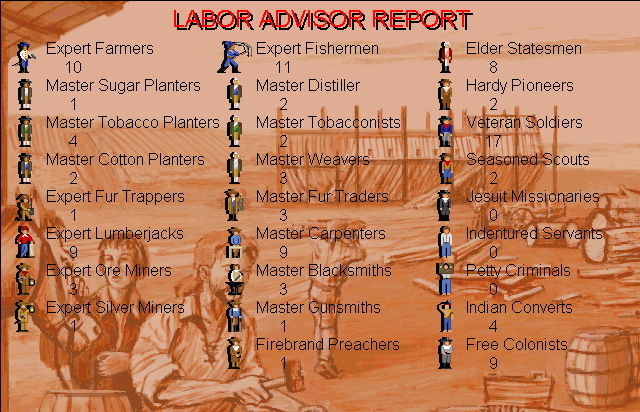 This lists the number of Colonists with a particular skill, and where they are. This will pinpoint skills deficits, and tell you whether you have a particular skill. It will also show how many Colonists need training. This will show European Trade, Bid Prices, Ask Prices, and Cargo in Ports. This lets you decide what to trade in by showing you how much profit you make. It also shows where shortages and surpluses are, allowing Cargoes to be moved where they are needed. This shows Military Garrisons - Levels of Fortification and Units in each Colony, and Sons of Liberty Membership - with Statesmen, Printing Press, or Newspaper. This will pinpoint vulnerable and inefficient Colonies. 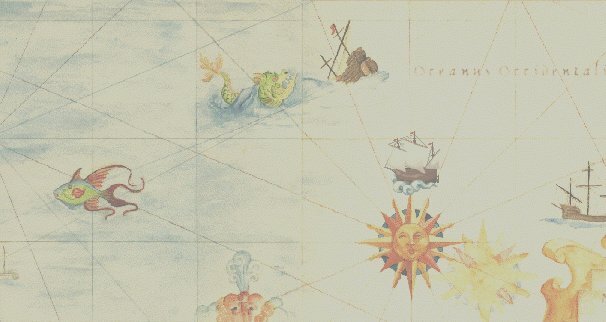 This shows all Ships in you Navy, with Cargo, Location, and Destination. It will show how many are being repaired, and whether you need a stronger Navy. This shows who is at War with who, and the number of Rebels and Tories for each Power. Powers will only be listed when you have contacted them, if they have become independent this will also be shown. When Jan de Witt joins Congress, Population, Military Power, Naval Power, Merchant Marine, and Number of Colonies will also be listed. Consult this before starting a War. This will list Indian Tribes once you contact them, or if they become extinct. There are 8 tribes to contact. It also gives number of Muskets, Horses Herds (50 per herd), and level of development. You gain points for Citizens (more if there trained), Members of Congress, Gold, and Rebel Sentiment.